Theon to his father Theon greetings. It was so nice of you not to take me with you to the city. If you refuse to take me with you to Alexandria I won’t write you a letter or speak to you or wish you good health. So, if you go to Alexandria I won’t take your hand or greet you ever again. If you refuse to take me, this is what will happen. And my mother said to Archelaos that he is upsetting me, take him away! 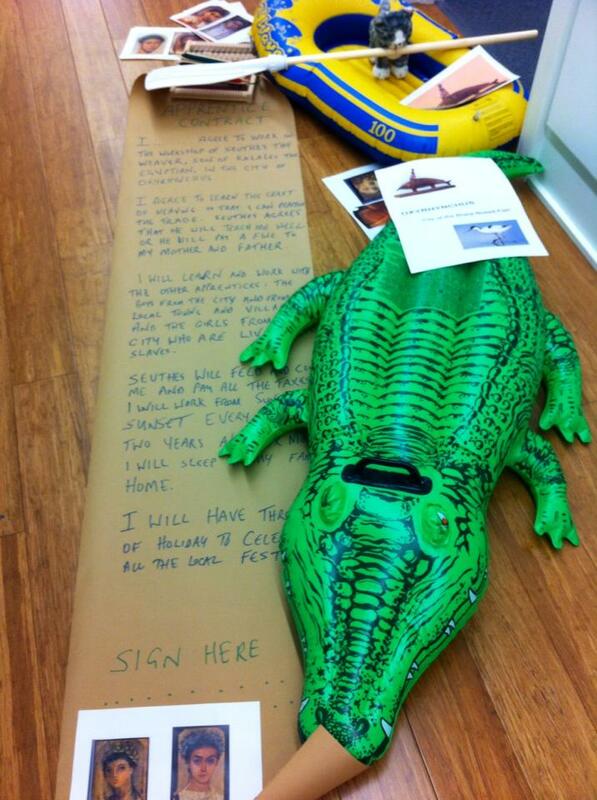 It was so nice of you, sending me these great presents, just rubbish. They put me off the track on the 12th, the day when you sailed. Well then, send for me, I beg you. If you don’t, I won’t eat, I won’t drink; there! I pray for your health. Tybi 18th. Deliver to Theon from Theonas his son. As far as we are aware, only three children’s letters from Greco-Roman antiquity have survived the ages and present themselves to us, so the text above is quite exceptional. It is a letter written on papyrus, found in the city of Oxyrhynchos (now El-Bahnasa), some 200 km upriver from the present-day Cairo and 400 km from the sea and Alexandria, Roman Egypt’s cultural and administrative centre. The dating of the letter is uncertain, but most probably it dates to the second or third century CE. In any case, the calendar date is January 13th (or 14th, if the year in question was a leap year). The translation above is based on that of Peter Parsons, but it is modified by Ville Vuolanto. For the original Greek text with technical information, see papyrus.info. Even though the letter does not mention its author age, we can reasonably expect him to have been rather young. He seems to have written (and composed) the text by himself, and had therefore already been able to acquire some literacy skills. On the other hand, he is by no means allowed to move around freely and, above all, his way of behaving and expressing himself certainly does have the air of childlike sentiment and concern. This boy was, presumably, over ten years of age, but still not yet reached the legal majority (fourteen). The text combines two different rhetorical strategies: first, the adult-tone, with recourse to irony: ‘so nice of you’, and with the present, and the socially correct means of addressing and elder. On the other hand, there is the childlike-tone, featuring attempts at emotional blackmail: he won’t speak, greet or eat if his hopes are not fulfilled. Theon even refers to the words of his mother, playing his parents off against one another to back up his claim that he is indeed very, very disappointed. The translation cannot do full justice to the textual characteristics of the original letter: the editors, Bernard P. Grenfell and Arthur S. Hunt, remark that it is ‘[w]ritten in a rude uncial hand, and its grammar and spelling leave a good deal to be desired’. A good illustration of this is the writer’s problems in reporting indirect speech. Not surprisingly, there are many problems in translation, as it is not always clear what is going on in the text. For example the reference to the present is not completely clear. The word is arakia, which literary means chickling beans (lathyrus sativus). Thus, a translation such as ‘beans’ would be possible. However, here, in line with the general stroppy tone of the letter, if we interpret this to denote ’weed’,’refuse’ (or ‘rubbish’, here, as Jaakko Frösen has pointed out), then we may be more to the point. We have here a boy whose father does not want take him along with him out into the big wide world of the Roman empire’s second biggest city, Alexandria. Yet, we also have here a, dare we say, precocious child, who certainly is privileged compared with most of his peers: he has access to education and he comes from a fairly wealthy family. His father is doing business in Alexandria for a longer period, and he himself has access to papyrus to write on – and he took full advantage of his situation. Naturally, to write a letter may have been the idea of Archelaos (perhaps an older relative, or a teacher) but the wording shows that the ideas presented were boy’s own. The letter is written in Theon’s home estate, which his father has left without informing his son, to take the boat from the city of Oxyrhynchos further down the Nile. And from Oxyrhynchos the letter was finally found, thus, most probably, it was originally sent – even if we cannot know whether Theon’s father ever received and read it. So what can we learn about children’s lives in Egypt from such a letter? We have here an example of a child’s multi-layered agency: Theon wants to experience Alexandria, and he pesters his mother and goes to the effort of writing a letter; he is also proclaiming his agency by greeting or not greeting his father, and – though perhaps not so convincingly – by eating or not eating. Certainly, he presents himself as a subject in his own life. The intervention of an adult may account in part for the idea of writing a letter in the first place, or in formulae of address and conclusion (although these could simply reflect such well-embedded cultural conventions, that a boy Theon’s age and position could discern and mimic them). In particular the shifting tone at the end of the letter is amusing, and shows that ‘I pray for your health’ is there because (and only because) one should end letters with this expression in polite circles. It is also of interest that at the beginning of the letter he uses his real name, Theon – but when adding the address, he shifted to use his pet name, Theonas. Theon is actively trying to influence decision-making in the family. The letter is a rhetorical exercise. He tells what he chooses to tell about his experiences: he works hard to convince his father of his deep disappointment at the family decision. The interplay of social conventions and his immediate concerns are made visible in an exceptional manner: he is socialized with regard to his ‘family culture’ rather than with the requirements of the wider cultural discourses. There is little sign of the kind of filial piety which ideally should permeate all interaction between children and their parents. The milieu in which his action takes place is convincingly depicted: a household with his mother and some other people, with freedom to action and to express his opinions and experiences. Perhaps the most interesting point in our present context is that he seems to think this actually could help. Theon is not an oppressed or frightened child. He is not afraid of losing the emotional support of his nearest and dearest even if he is himself angry and irritating. As such, this is an isolated text, and, as noted, nearly unique. No firm conclusions about the ‘usual’ experiences of childhood or prevalent patterns of family dynamics can be drawn from this kind of anecdotal evidence: it is his own world Theon is experiencing. But it shows what was possible within certain limits, at least in some contexts and in some families. This kind of micro-historical evidence of life in the ancient world’s cities and communities, is invaluable in showing us the cultural expectations and the, usually well-hidden, lives of their inhabitants. Another is SB III 6262 (Third century, of unknown provenance). The third case is a fourth century BCE lead table found in the Athenian Agora (Agora inv. IL 1702). Our first road block: papyri from the Oxyrhynchos area do not in fact feature many travelling children (statistically speaking) – but our material does include some 35 cases which can be interpreted as referring to some kind of travel for children outside of their local environments. For the majority of children, it was only in their early teens that their perspectives would have widened beyond the household; for most, this was due to their work in fields, workshops or even in other households. Elites children were in a position to move away from their homes for a higher education in the city centre of Oxyrhynchos, or in some cases much farther away – 200 kilometres downriver in Alexandria. The most well-recorded group of travelling children in our sources were of slave status, who were recorded in documents related to transactions of slave-trading. 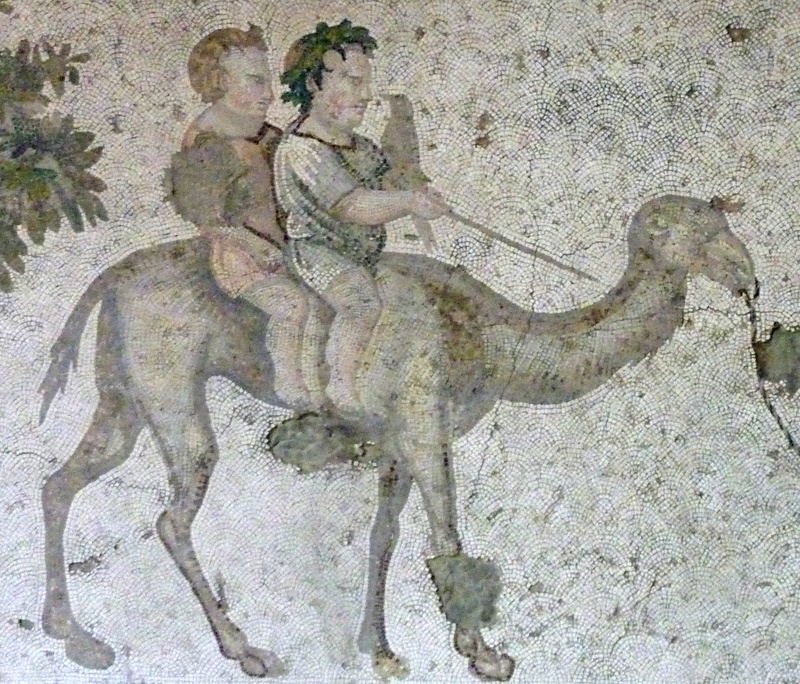 This kind of movement – born of circumstances beyond the person’s control – was a huge feature of mobility in the ancient world; the results of such trading in people, and often movement of free people in the aftermath of war or political turmoil, accounts for the overwhelming majority of mobility in the Roman world. Aurelius Quintus son of Hilarius of the city of Caesarea [of Mauretania] … has sold through the landed bank under the herald Marcus Aurelius Dionysius son of Dionysius son of Dionysius son of Aponetus, a slave girl (korasion) called Vic… [alias?] Rufina aged ten… , a mauron by birth, at the price of …50 denarii. Aurelius Epimachus … has bought [her?]. Here, a slave girl, Rufina, who was originally from Caesaria Mauretania (present-day Cherchell, near Algiers), was sold in Rhodes (where this document was drafted) when she was ten years old (the age can also be as high as nineteen). Rufina eventually ended up in Oxyrhynchos (P.Oxy L 3593). Quite a journey, quite a fate. It was not only children of slave status who were on the road, even if for them their travels were unquestionably much longer and farther than for others. A primary example of this is shepherd named Petemounis, mentioned to be a minor (thus under fourteen), whose home was at the village of Kerkemounis in the upper toparchy (1st pagus), but who was pasturing in the neighbourhood of the town of Pela in western toparchy (3rd pagus), at minimum some fifteen kilometers from home. While this distance easily could have been covered on foot in a half a day when off duty, he is also mentioned occasionally to have tended his flock ‘throughout the entire nome’, that is, even much farther away from home. For him, the rural areas of the Oxyrhynchite nome must have become quite familiar early on, with also the responsibility of the flock – mentioned to consist of twelve sheep and three goats with their lambs and kids in 29 CE (P. Oxy XXXVIII 2850). If any of our readers has any idea how quickly such a flock with a shepherd can move (km per day? ), we would be happy to hear! The experience of children’s lives was not universal (as it is still not, today), and for many children in or from Roman Oxyrhynchos their local environment extended beyond their immediate home and family into wider communities, environments and sometimes other countries. Such mobility would have had significant cultural, social and psychological impact on those children, and undoubtedly would have helped them to shape their lives and the meaning they attached to the world around them. A case in point are the Goths in service at the Apion estates near Oxyrhynchos in 560s AD, who seem to have formed a small Gothic community of their own, with their wives and children. These immigrants or refugees in the aftermath of the Gothic wars – which had laid waste much of Italy – found a new home far away across the Mediterranean. You can listen to a podcast of Professor Peter Heather (of King’s College London) speak on refugees in the Roman Empire, here as part of the Oxford Refugee Studies Centre. The ‘new world’ was peaceful and gave people their daily bread (see PSI VIII 953 and 956 with Norman Underwood’s fascinating article online), but for their children the cultural shock must have been tremendous. The conference was live-tweeted, and you can see some of the comments on the discussions here (like: ‘Overheard at the conference #PassagesVI “17-year-old is too old for us”‘ (Reima Välimäki)). Newcastle-Upon-Tyne’s history stretches back a long way. Labour and movement in and around the North East, and cultural integration, are prominent features of its history, and Newcastle is now host to a number of immigration and refugee services. This kind of movement is, of course, not new. People travelled widely in the ancient world and landed in the big cities for strikingly similar reasons. Flight from war and its aftermath, political turmoil and religious and other persecution was not uncommon, and mobility for economic reasons was a huge part of life across the ancient Mediterranean. Its impact and influence on families – and children in particular – would have been vast, either negatively or positively. So how can we use the ancient world to help children in Newcastle frame their own experience of meeting other children and families in circumstances like these? And, of course, vice versa: what can children’s perspectives on mobility today tell us about likely patterns in the past? Where better to explore this locally than with children in West Jesmond Primary School? A school which teaches pupils from an extraordinary wide range of ethnic, social and religious backgrounds, and works hard to bring the University and local community into its pupils’ education (see their Twitter account!). 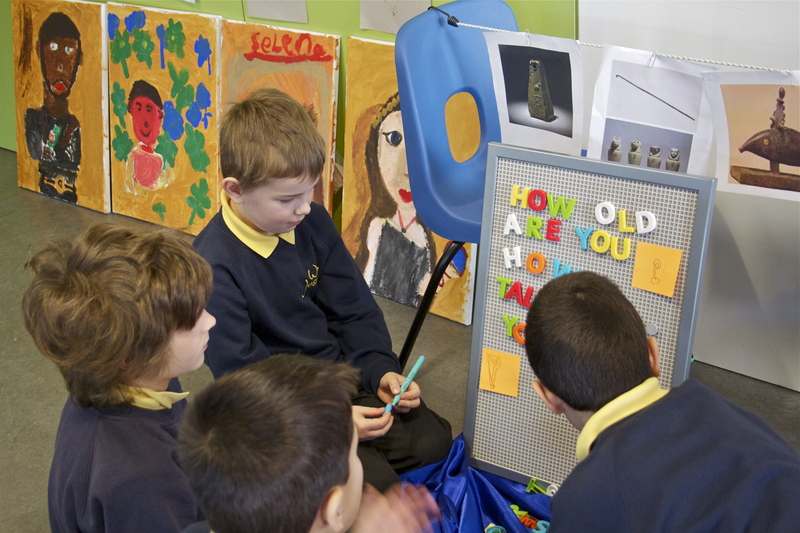 For a research contribution to Newcastle University’s new Beyond Frontiers project, I created two workshops for Year 4 pupils. Our research on the Children in Oxyrhynchos project (Pudsey and Vuolanto) seemed like a good opportunity to test the waters: how do children in modern-day Newcastle think about movement to a new city and all that it entails? Beyond Frontiers provided a chance to ask that question of children, using role play scenarios based on the lives of their ancient counterparts — and to use ancient historical research to do so. 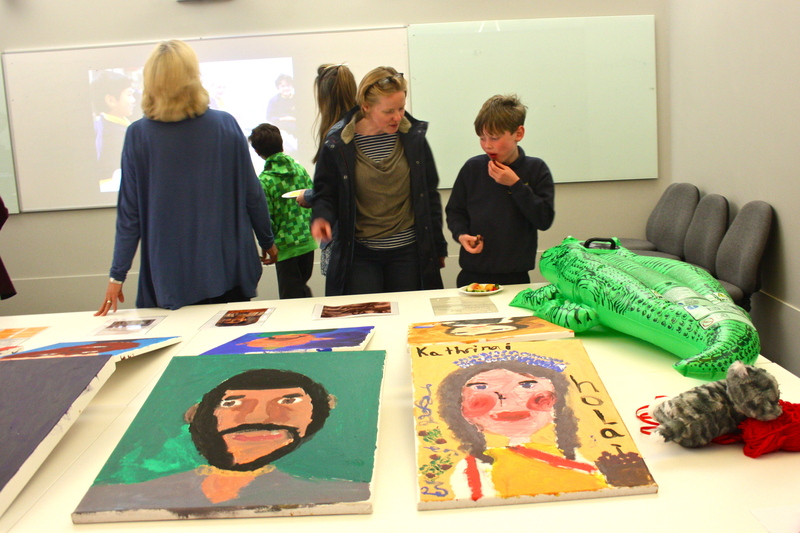 The pupils were of course enthusiastic about the workshops (and not only because it got them a few afternoons off school…), and I learned a good deal about what sorts of perspectives children can take on cultural diversity. On their travels, our intrepid young adventurers met Stephanos, a Greek man who had travelled from Greece to become a mummy embalmer in the village of Tebtynis, and then moved to the city of Oxyrhynchus. The pupils were guided to ask questions about why Stephanos was embalming a crocodile in the first place, and thought about the importance of local and regional beliefs and customs. How important is this sort of religious worship to people who practice it? Why had Stephanos become an embalmer and moved to Egypt, and then this city? What was different here for him? What animal would they embalm and use to represent Newcastle? Next stop, they met the owner of the local weaving workshop, who asked if they wanted to sign a contract to become an apprentice in his workshop. The pupils cautiously examined an adaptation of an actual contract from second century A.D. Oxyrhynchus, and asked questions about the experience of working there (see our previous posts on these pages, on Romano-Egyptian apprenticeships). After a brief visit to the ancient city’s theatre and markets, our explorers finally met Marcus, a Nile boat driver and Roman citizen searching for his brother who had fled from war in Dura Europos. Marcus’ missing brother had gone ‘somewhere with a river’ — was it the Nile? Or the Tyne? Marcus carried with him an amulet which his brother had given to him as a memento, and the pupils thought about what kinds of objects from their homes they would give to family members and friends travelling away. They shared drawings and discussion about objects of their own they would like to keep with them if they left home (ranging from cuddly toys and kitchen implements, to super-soakers and smartphones with the family photographs on them). This tied in nicely with one of the other workshops the pupils had done on the biography of objects, based on one of our undergraduate Archaeology modules. 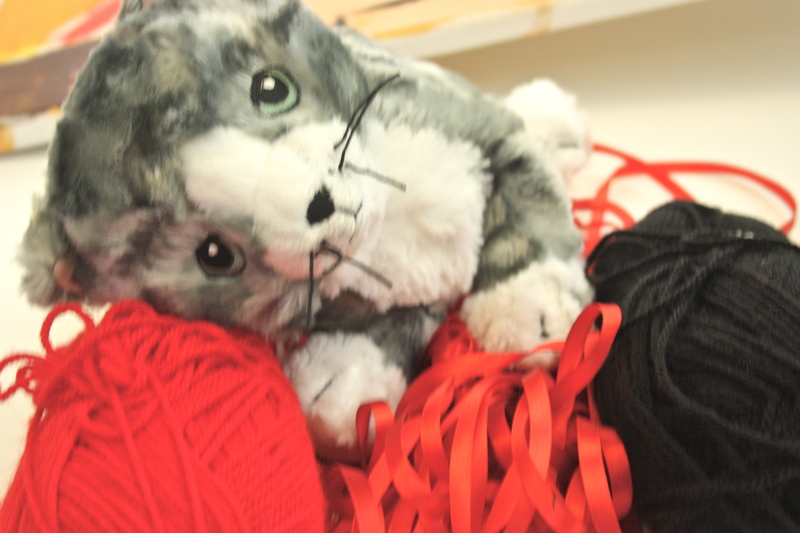 Sarapis the cat: on the hunt for the ‘Sharp-Nosed Fish’ of Oxyrhynchus. I ran follow-up sessions as part of the project, in the Great North Museum: Hancock. 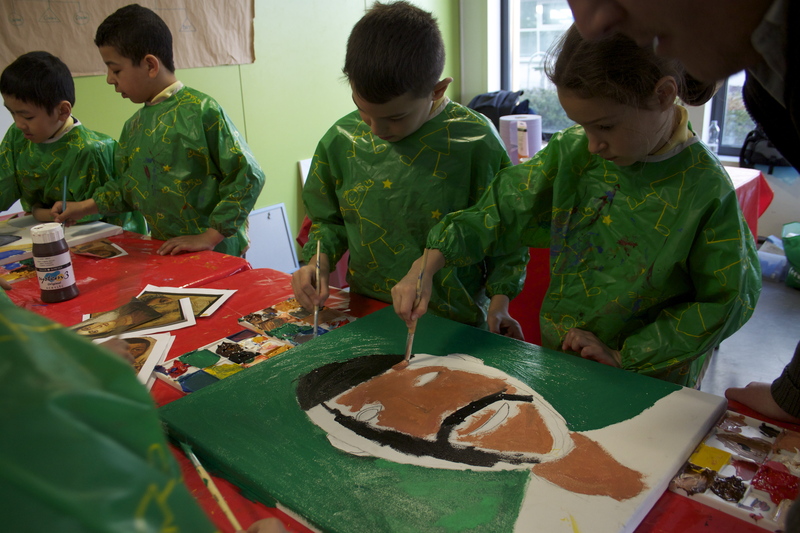 In these sessions the same pupils in groups of three or four used sample mummy portraits to think about creating their own characters and then to paint portraits of them onto canvas. 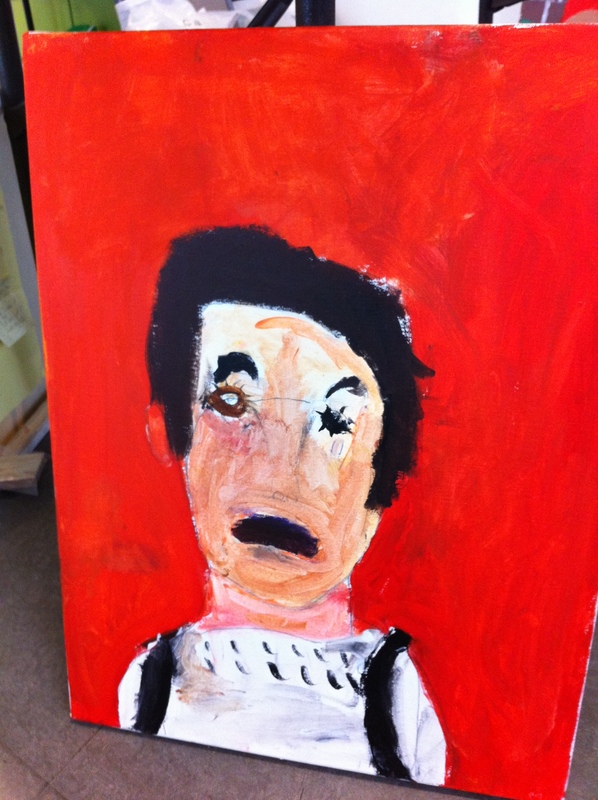 Each portrait character needed a back story, for which the children used those role play encounters as a guide. Who was their character? How had they come to be in the city? What cultures, dreams and attributes had they brought with them? 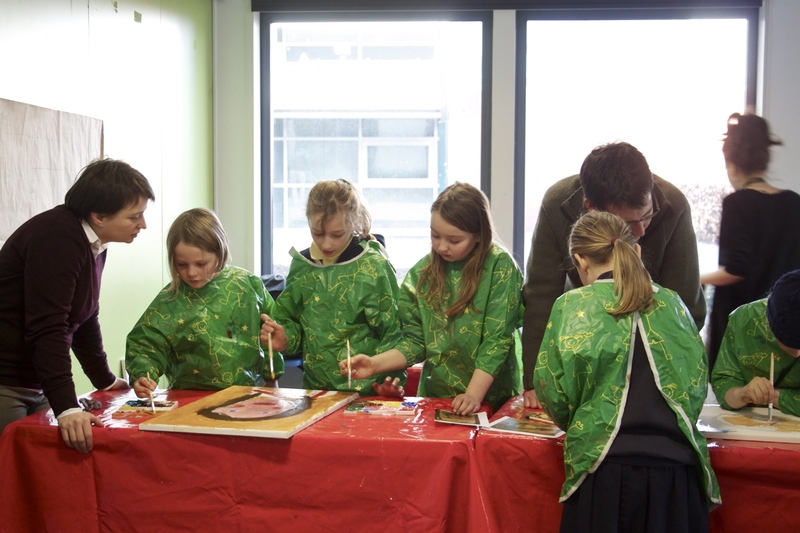 As I was shuffling around the small groups (ensuring some of the paint hit the canvas!) I overheard pupils compare these experiences with friends in their class, or people they knew about on t.v. or in their street. We learned about these made up characters’ likes, dislikes, fears, hopes, families, friends and travels — and it was clear the children had associated with these imagined situations in Roman Egypt, their own school, neighbourhood and city. This idea of using an ‘imagined contact’ is a widely acknowledged theoretical approach to the question of how, psychologically, social prejudices can be addressed and reduced. You can read about Richard Crisp and Rhiannon Turner’s work on this, here. Painting ‘David’, the Greek man in Oxyrhynchus. He likes pizza, music and his family. He has traveled around the Mediterranean. Photo: April Pudsey. Painting ‘David’, the Greek man in Oxyrhynchus. He likes pizza, music and his family. Photo: April Pudsey. 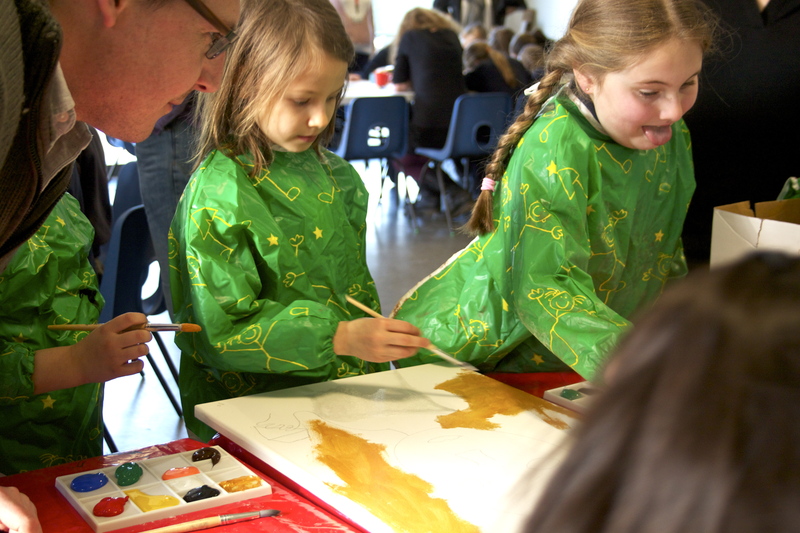 Painting with April Pudsey and Joe Skinner at the Great North Museum: Hancock. Photo: Jordan Bayley. This man wears special clothing that ties him to his local social and religious group. This woman wears a special design on her clothes, that reminds her of home. She also wears an amulet, given to her by her sister to remind her of home. 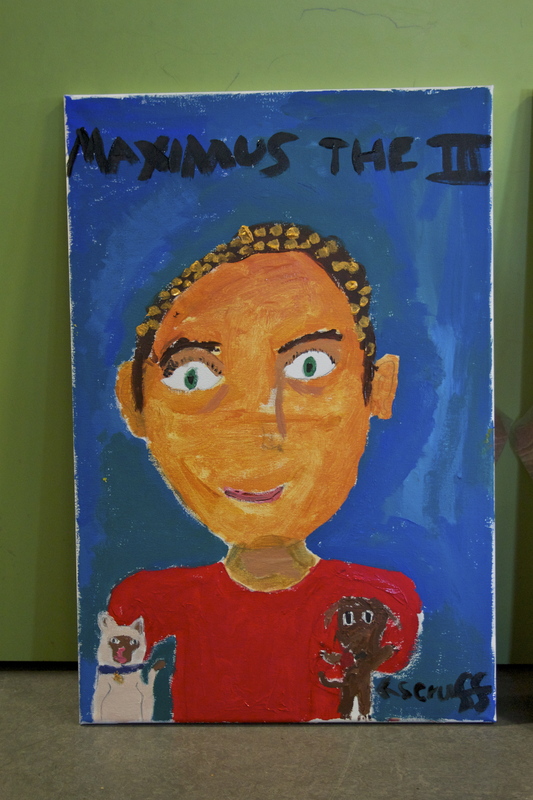 The Children in Oxyrhynchus activities made up the research element of the Beyond Frontiers project. Colleagues in Classics and in Archaeology at Newcastle (Dr Joseph Skinner, Dr Sally Waite, Dr Mark Jackson and Rose Mockford), along with those in the Great North Museum: Hancock, ran workshops in tandem, based on our undergraduate teaching: coinage and local identity; and on important and significant personal objects – object biographies. 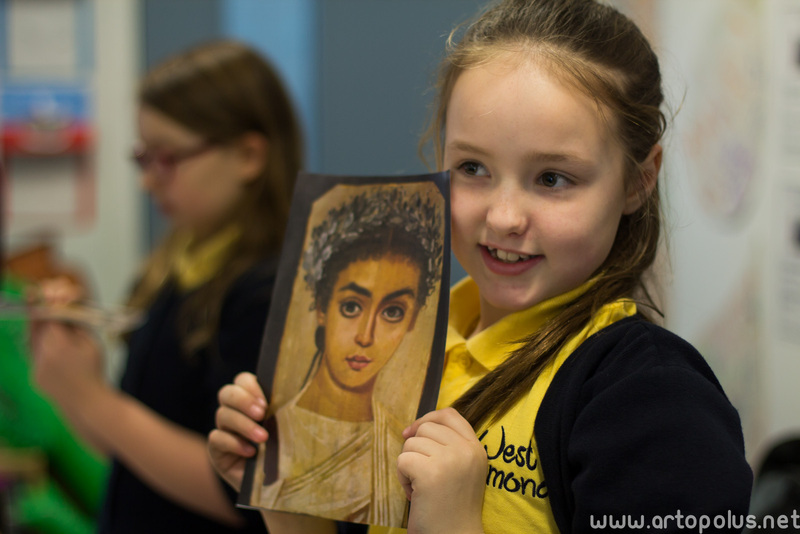 All Year 4 pupils had the opportunity to participate in the full range of activities, and to think and talk about cultural diversity in the ancient world, applying it to their own modern-day life in the city of Newcastle. The theme was prominent in the Year group’s work for the year, and the success and innovative nature of Beyond Frontiers activities were mentioned in the school’s ‘outstanding’ Offsted report (we were lucky enough to meet Offsted inspectors on a day when these workshops were happening!). 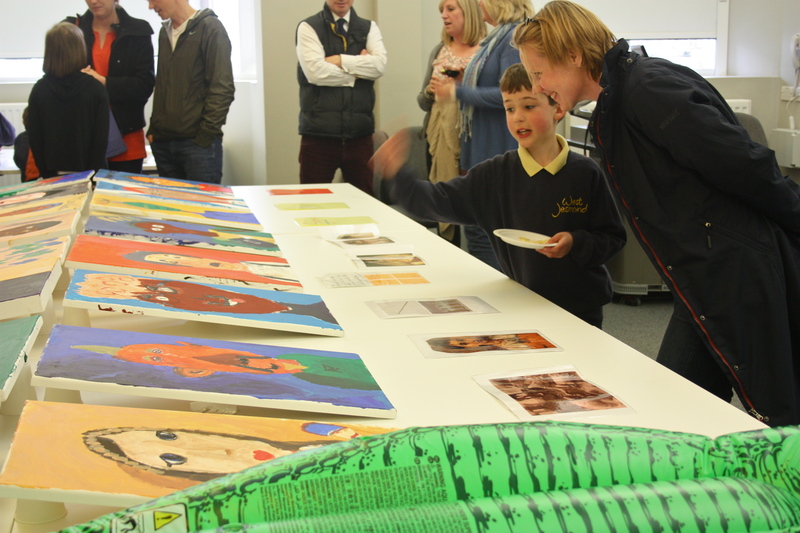 In addition to the workshops in the West Jesmond Primary School and the Great North Museum: Hancock, the Beyond Frontiers project also held an exhibition for parents in West Jesmond Library, an exhibition for parents and teachers in Newcastle University, and a public exhibition in the gallery of the Great North Museum. For more details on the whole Beyond Frontiers project, you can watch this two-minute Video documentary featuring both myself and Dr Joseph Skinner, who co-ordinated the BF project. Beyond Frontiers is a collaboration between the School of History, Classics & Archaeology at Newcastle University, West Jesmond Primary and the Great North Museum: Hancock. You can email the project on BeyondFrontiers@newcastle.ac.uk The website for the project will be updated with material soon. In Late Antiquity, asceticism challenged the traditional norms and practices of family life. The resulting discussions of the right way to live a Christian life provide us with a variety of texts with information on both ideological statements and living experiences of Late Roman childhood and children. Ville’s book, which came out in April 2015, Children and Asceticism in Late Antiquity. 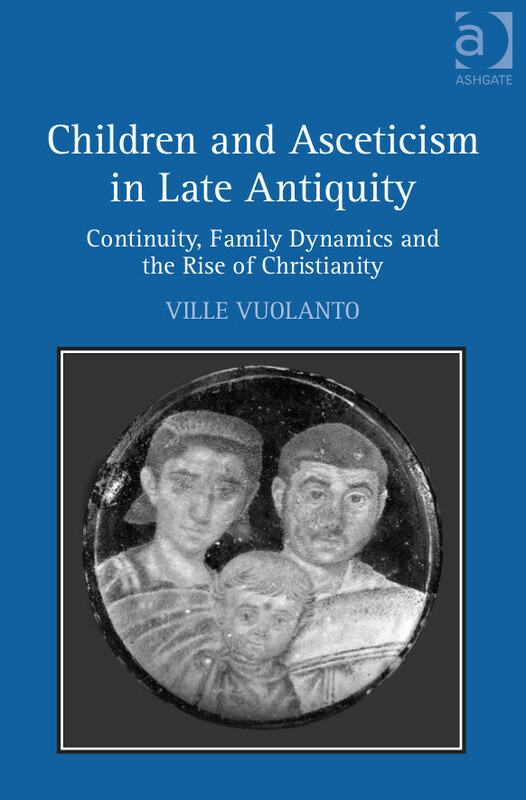 Continuity, Family Dynamics and the Rise of Christianity, is the first major book-length study of the interplay between children, family and asceticism in Christian ideology; it is also the first to scrutinise in depth the roles of children in family dynamics for any area of the Roman World. Why did parents want their children to become ascetics instead of contributing to their family lineage and, thus, their own continuity? By taking this question as its starting point, the study contributes to the discussions on family ideology, role of children and family dynamics in Late Roman world; to the study of Christian asceticism in Late Antiquity; and to modern theories on family strategies and continuity. Christian authors of the late fourth and early fifth centuries challenged the traditional Greco-Roman view that family was the central means by which the immortality in the continuity of the name, lineage and memory was assured, pointing to the superiority of asceticism in safeguarding meaningful life. “‘I will give you an eternal name’ … what more do you seek?” (Augustine, On Holy Virginity 25). Indeed, old ways of life were deeply embedded in the culture. It is shown in the book how asceticism fitted into the upper class culture and mentality, and how it was put into practice on the family level and in the lives of children, with some promised to God at their birth, some others driven to conflicts with their parents. 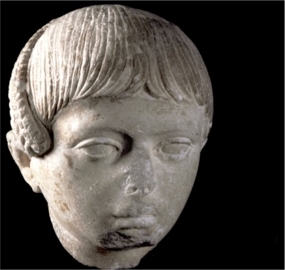 These processes are informative in showing how the late Roman elite families worked, and what was the role of children in the contemporary culture. Uptown Girls in Roman Oxyrhynchos? ‘…for this period of time her father will see that his daughter abides with Thonis, not spending a night or a day away, being fed and clothed for the whole period by Thonis instead of receiving wages…’ P.Oxy. LXVII 4596 (264 C.E.). in Greek, here. It seems it was only because of the father’s financial situation the girl was to leave the protective sphere of her own household. Thus, here the focus of the apprenticeship was not necessarily borne of the desire for the girl to learn a trade, instead it was a convenient means of securing a loan to the family — of course, it’s difficult to say how this might have impacted on Aurelia Aphrodite’s experience of that four years with Thonis the weaver (it may well have made little difference…). ‘…hand[s] in the petition and request you to order him to be brought before you and to proceed against his outrages so that the girl can receive redress and treatment.’ P.Oxy. XXXIII 2672 (218 CE) (trans. adapted from original editors), in Greek, here. Both of these girls lived as slaves in households in Oxyrhycnhos, and we see them here as particularly significant, even cherished members of those families. while still we were children. purple grief lays hold of me. Wretched Erinna! Nineteen, I moan with a blush to grieve. . . . mortal bloom of women growing old . . . . cries out the laments . . . flame . . . O Hymenaeus! . . . .” PSI IX 1090 (1st c BCE) (trans. adapted from the transs. by Daniel Haberman 1993 and Josephine Balmer 1996). Last November this blog caught a brief glimpse of fame as a University of Oslo press release drew attention to our research on Growing Up in an Ancient Metropolis. Somewhat unexpectedly, the press’ attention was directed towards our thoughts on the gymnasium and its role in the lives of this ancient city’s youths. Some journal and internet articles likened the the activities of the gymnasium to the more modern experience of ‘a scout group’, other youth organisations and even a kind of fore-runner to the Y.M.C.A. Of course a (perhaps nostalgic/haunting) association with secondary schooling lurked behind some of these comparisons; activities familiar from our own childhoods often present a convenient short hand for the customs of raising and training children in ancient cities. It’s very easy to understand why we might want to compare some aspects of life in the ancient world with their more modern counterparts, when we’re dealing with an experience as universal as moral and civic education of children. In our research, we take into account that we are not dealing with the gymnasia of Athens, known to Pericles, Aristotle and other writers. Many hundreds of years and many hundreds of miles separate the gymnasia of Roman Egypt from their classical and Hellenistic predecessors, even if they still were considered as the cradle of the civilized urban life. Indeed, one of the aims of our project is to achieve an overall picture of the working of the gymnasia in connection to the city life in general, and its role in the lives of young men in particular. Our research in this area is still preliminary, but we can say a few things about the gymnasium in Oxyrhynchus. First of all, the gymnasium was not open to everyone. Unlike the origins of the Scouts and the Young Men’s Christian Association ancient gymnasia were only open to the youth of the privileged groups. 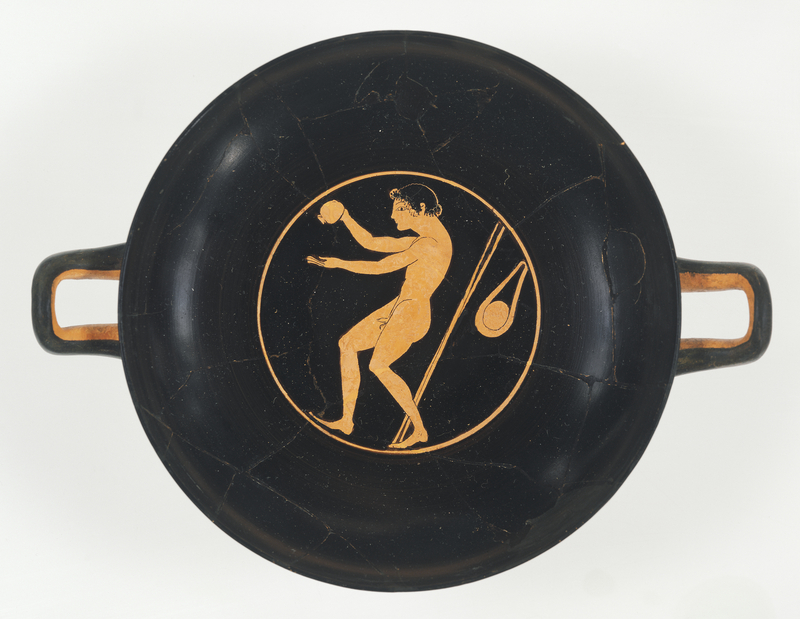 In Oxyrhynchus we lack detailed information on the initial ‘birth’ of the gymnasium – when this institution starts to show in our sources, in the latter half of the first century, it was already welcoming new generations of young men in through its doors through a recruiting process of scrutiny (epicrisis). The family background of the applicants was the deciding factor in this scrutiny; boys turning thirteen or fourteen (or rather their fathers or guardians, sometimes even mothers) had to prove that from both sides of their family, their older male relatives had been also been accepted into the gymnasium (usually in the same city). Secondly, the gymnasium was the focus of an entire social and political group, the gymnasial group. In fact, people of privileged status in Oxyrhynchos were divided in two: the metropolitan group, which represented the lower elite status group who enjoyed reduced taxation and presumably functioned as a recruitment pool for the top group of the city, and the gymnasial group. From the gymnasial group were recruited the members of the city council (boule) and the highest officials of the community – and it was only the male offspring of this latter group who were given access to the gymnasium proper. So, what is a gymnasium in Roman Egypt? We don’t know much about this side of things for many ancient cities at all but our systematic approach to the Oxyrhynchus material has led us down some interesting paths. Certainly, the gymnasium in Roman Egypt represents a later interpretation of the classical institution, in which the boys ideally developed ‘a sound mind in a sound body’. The gymnasium was still used (also) as a bath-house; in one document we note that clothes were checked at the door of the gymnasium, as in any bath house in the Roman world (P.Giss. I 50). It seems that the gymnasium as both a place and an institution of sorts, was primarily one in which sons of the urban elite were to learn how to be good citizens, while growing up to conserve the values of a particular social group with a very distinct heritage in the city. Training in both sports and the principles of classical Greco-Roman learning (paideia), were a highly suitable means of achieving and perpetuating this kind of group social identity, and of being able to serve their city as adults (for instance, as benefactors or as members of the town council, the boule). And what was important was that they made connections between themselves for their future success, seemingly even across the gymnasia of different cities. At this point in our research, the answers to some quite crucial questions remain beyond our grasp, and that of the source material. How many of the city’s boys got to engage with gymnasial life: was it indeed reserved only for the boys from the highest echelons of the local community, the uncontested local elite – this would mean only five percent or less of the age group. But if the selection (epicrisis) was more liberal, and the status had spread during the many decennia of the institution’s history, we might be dealing with even 15 to 20% of the age bracket. And given its upper-status character, how much privilege, power and networking was actually preserved for the futures of the young members of the Oxyrhynchos elite? Over the past week, our project has caught the attention of the world’s media, following the University of Oslo’s Press Release of a brief interview with Ville. Something about children’s lives in the past, and what we know about them, has struck a chord in the hearts and imaginations of many of those who have (re-)tweeted, republished and re-blogged the interview. Sarah Griffiths of the Mail Online was particularly interested in aspects of the gymnasium. It was genuinely pleasant to be able to talk about our research, in a way which would be presented to a public audience with interests in the past. In Roman Egypt, 14-year-old boys were enrolled in a youth organization in order to learn to be good citizens. So says social historian and historian of ideas Ville Vuolanto, University of Oslo, who has joined forces with Dr April Pudsey of Newcastle University to dive deep into a mass of material of around 7,500 ancient documents written on papyrus. The texts comprise literary texts, personal letters and administrative documents. Never before has childhood in the ancient world been researched so systematically using this type of material. The documents originate from Oxyrhynchos in Egypt, which in the first five hundred years CE was a large town of more than 25,000 inhabitants. Oxyrhynchos had Egypt’s most important weaving industry, and was also the Roman administrative centre for the area. Researchers possess a great deal of documentation precisely from this area because archaeologists digging one hundred years ago discovered thousands of papyri in what had once been the town’s rubbish dumps. Little is known about the lives of children until they turn up in official documents, which is usually not before they are in their early teens. It seems that children began doing light work between the ages of seven and nine. Typically, they might have been set to work as goat-herds or to collect wood for fuel. Only boys born to free-born citizens wealthy enough were entitled to be members of the town’s youth organization, which was called a gymnasium. These boys were the children of local Egyptians, Greeks and Romans. Their families would necessarily have been quite prosperous, and have had an income that placed them in the ‘12 drachma tax class’. It is uncertain how large a proportion of the population would have qualified, probably somewhere between 10 and 25 per cent, Vuolanto explains. Girls were not typically enrolled as members of the ‘gymnasium’, but are often mentioned in the administrative documents as being the boys’ siblings, and in a few cases enrolled alongside them. This may have had to do with family status or tax class. Both girls and women could own property, but in principle they had to have a male guardian. There were probably a good number of children who did not live with their biological parents, because the mortality rate was high. For boys from well-off families of the free-born citizen class, the transition to adult life started with enrollment in the gymnasium. Other boys started working before reaching their teens, and might serve an apprenticeship of two to four years. The researchers have found about 20 apprenticeship contracts in Oxyrhynchos, most of them relating to the weaving industry. Most girls remained and worked at home, and learned what they needed to know there. They generally married in their late teens – thus younger than boys who usually married only in the ir early twenties at the earliest. But life was different for slave children. Vuolanto says they have found documents to show that children as young as two were sold and separated from their parents. “It’s like putting together a jigsaw puzzle. By examining papyri, pottery fragments with writing on, toys and other objects, we are trying to form a picture of how children lived in Roman Egypt,” explains Vuolanto. * There are other cases: more to come in later blog posts! 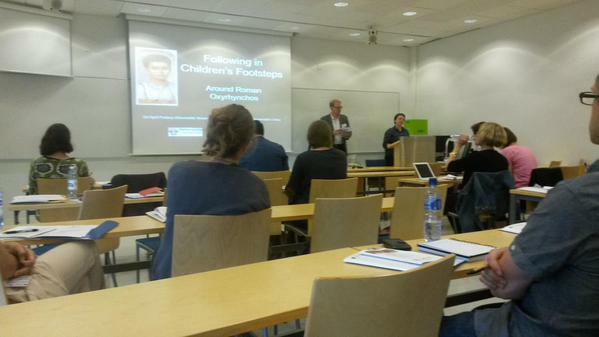 This May saw the three-day international workshop at the University of Oslo with the title Children and Everyday Life in the Roman World. 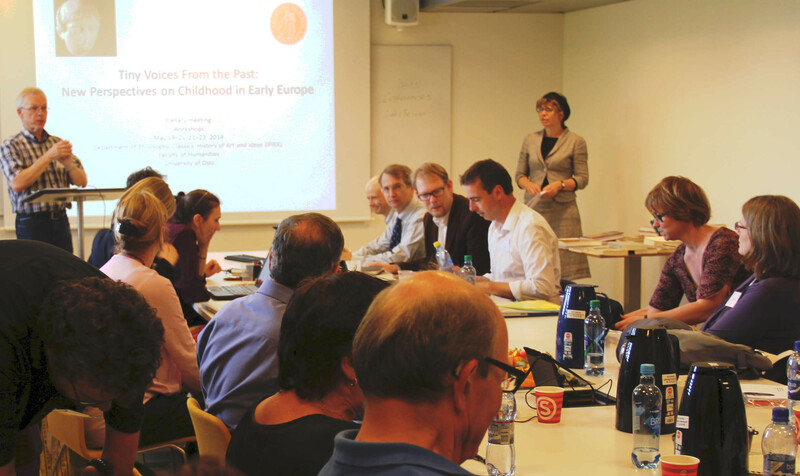 The main purpose of this workshop was for leading experts in fields relating to the history of ancient children to present and develop articles for a new publication which would address the everyday lives of children in Late Antiquity. Children, and their perspectives, served as the starting point and, in as far as possible, their experiences and agency were our central focus. The initial call was to push the very limits of our previous knowledge and to explore new means of tracking children’s cultures, experiences and agency as far as possible from the evidence, and from interdisciplinary approaches. Participants of the Children and Everyday Life -workshop, along with remnants of an Origins of Western Childhood workshop which took place earlier the same week. 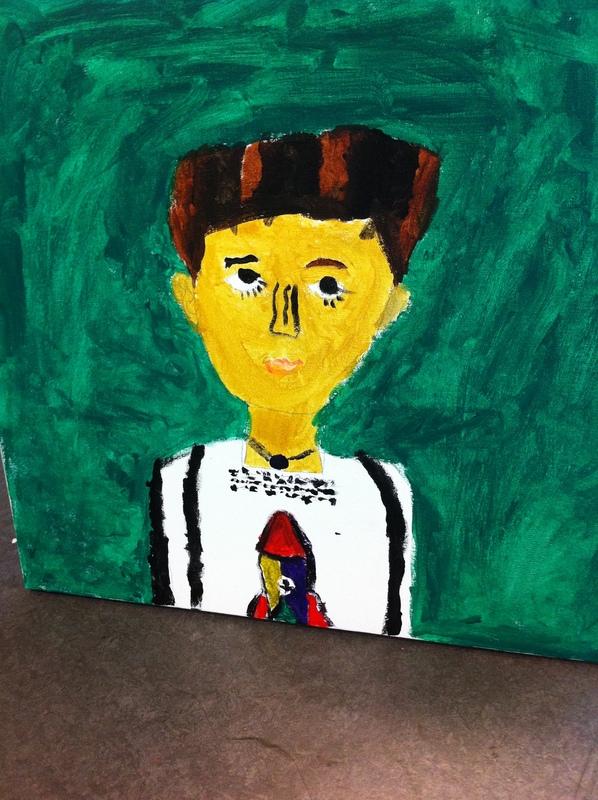 Together we were twenty experts in ancient childhood, education, families and popular culture. Participants were well prepared, having read and digested pre-circulated drafts of one another’s papers, which created a good opportunity for in-depth discussions. As such, this was the first academic meeting of its kind – one in which we attempted a task often viewed as near-impossible, to view children’s lives in the ancient past from the perspectives of those children themselves. This approach, as yet un-developed in publications on ancient children, yielded many exciting results. Pretty much the entire scholarship on children in Antiquity and the Middle Ages! In two particularly inventive papers, for example, we pondered how the cityscape would have appeared to the eyes of a child, both from the perspective of Roman children in Pompeii, and that of a Jewish boy in Tiberias; discussions of the graffiti inscribed by children added interestingly to this discussion on children’s spaces and agency. Children’s environments comprised not only walls, streets and fields, but also people; these interpersonal contexts and social environments were dealt with in our paper on children and the wider network of relatives in Oxyrhynchos, in Roman Egypt, using children’s relationships with their uncles and aunts as a case study for exploration. How children spent their time was one of the main areas for discussion throughout the workshop, and presentations on children’s leisure and play spoke directly to this question. While child-work was not much discussed, a paper from a paediatric surgeon on ancient children and accidents gave many insights into the (often perilous) activities of children, showing them taking care of carrying items and caring for animals, for instance (and, of course, the expected collection of breakages, cuts and swallowed items!). The lives of children in the margins were tracked through the themes of illegitimate and disabled children, both in law and in practice. Some children, naturally, also had access to formal education with strict discipline in schools and, later, monasteries. Also here, the theme of emotions and responses to adult expectations was a central one, and the papers on death on one hand and touch on the other were involved directly with the issues. While it was sometimes difficult to focus on children’s perspective and culture, the workshop well presented the newest wave of childhood studies in antiquity: the discussions prompted by Philippe Ariès, that is, the need to challenge the notion of a lacking in parental emotional investment in their children and of childhood as a separate phase in life in ancient world, are now over, and the field is open for other questions and inspiration from modern childhood studies. It will be very interesting to see the final versions of the chapters in the forthcoming volume. The workshops were organized under the aegis of the project “Tiny Voices From the Past: New Perspectives on Childhood in Early Europe” (University of Oslo / Norwegian Research Council), with prof. Reidar Aasgaard as the project leader – in the picture above he presenting the project; standing on the right Director of the host institute (IFIKK), Mathilde Skoie. 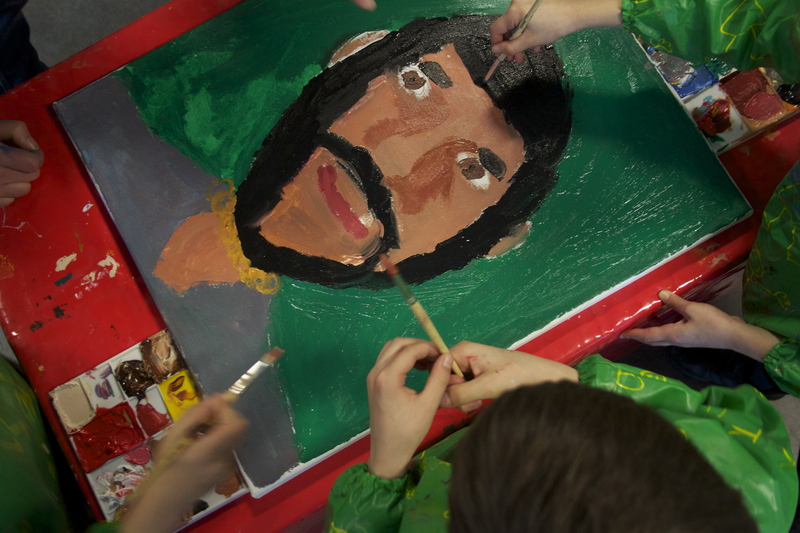 The project (2013–2016) studies the lives of children and attitudes to childhood in a culturally formative stage of European culture: Antiquity and the Early/High Middle Ages. Please visit http://www.hf.uio.no/ifikk/english/research/projects/childhood/ for fuller information. 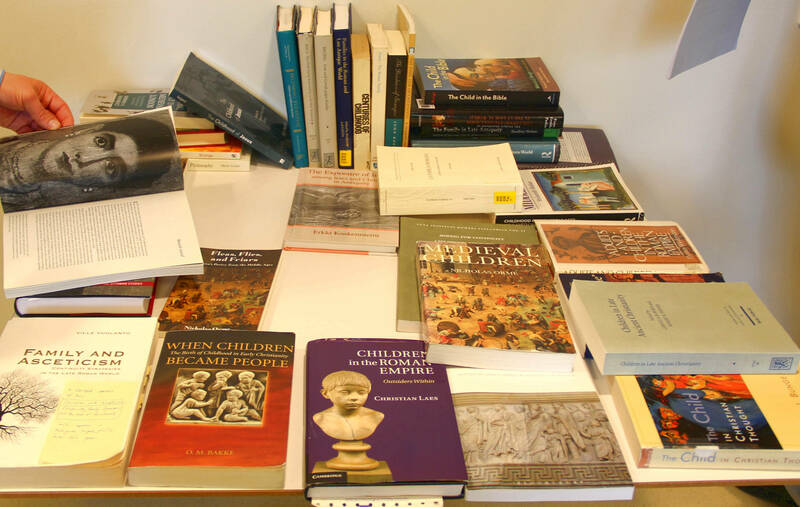 We’re currently working on our joint project ‘Children in Oxyrhynchos: Everyday Life in an Ancient Metropolis’. 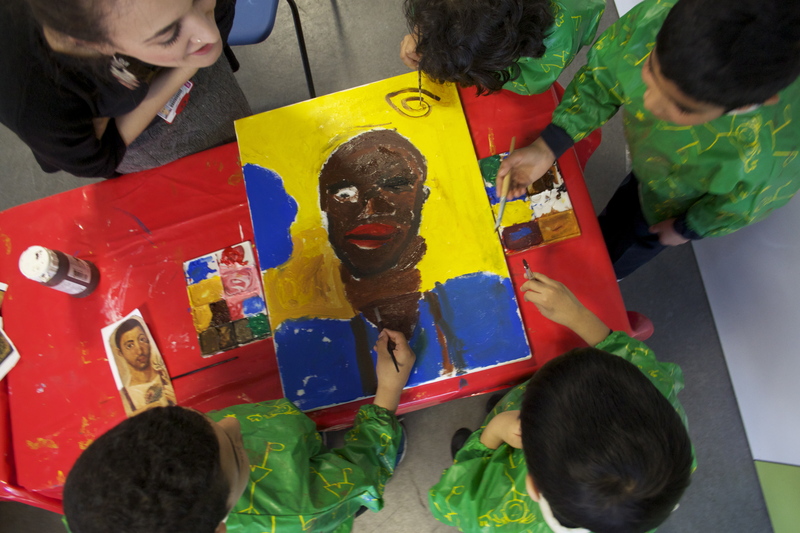 In it we aim to reconstruct as possible the lives of children within the particular physical and social environment of a populous and diverse (and well-documented!) ancient metropolis. We’re systematically analysing the environments, activities and experiences of children in the city, their web of social relationships, and their agency in shaping these aspects of their lives. Our case study is Oxyrhynchos: a major, heavily populated and Hellenised metropolis in the Roman empire at the centre of administrative, political, religious and socio-economic life for an urban population. Over 2,000 literary and 4,000 documentary papyri edited so far make up our source material and are testament to a range of socio-political statuses within the population. The ruling elite of the city were known as the gymnasial group – a hereditary social through which local and regional political power was distributed, within which there were Hellenised, literary circles who read, learned and adapted classical Greek literature. Beyond the gymnasial group were sub-elite and ordinary families, households and individuals, slaves, lodgers, tradesmen and migrants — all of whom are represented in the papyrological documents from Oxyrhynchos. We are in the process of collating and analysing these texts, especially those which explicitly relate to children. These documents range from household census returns, to official applications, petitions, legal documents and school texts and even private letters between family members and friends. Why did Didyme do what she did? Children of various ages, social groups and both boys and girls, feature in these documents and their experience of life in a Hellenised city in the Roman empire is here evidenced. 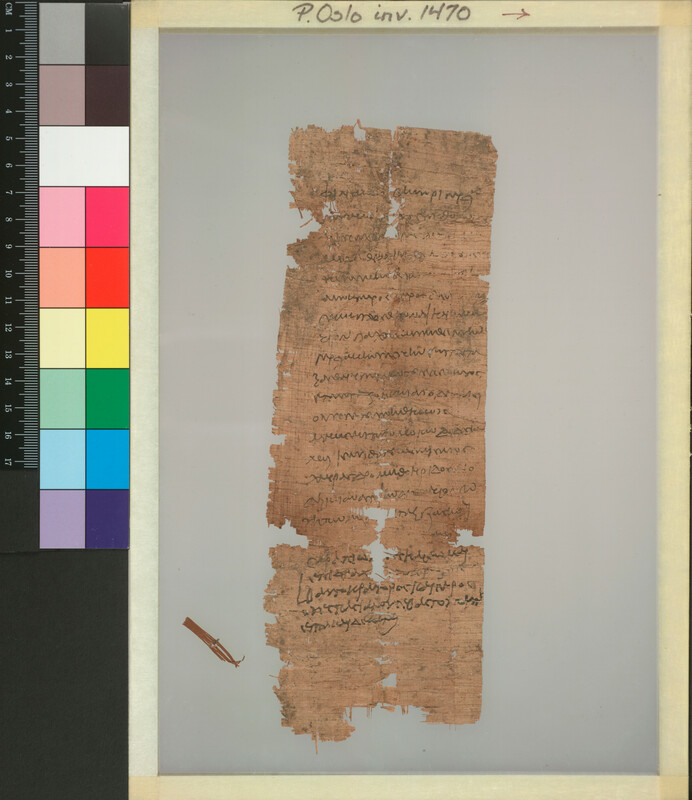 The papyrus below, from the collection in the University of Oslo, tells an intriguing story about living conditions and housing in Oxyrhynchos – you can read a translation of the text, here. In this document Aurelius is writing to petition the local police magistrate (ἐπεὶ τῆς εἰρήνη̣[ς]), complaining that he has been treated with insolence and assaulted by a woman named Didyme, the wife of Agathos Daimon the cook, when staying in his home. It seems from this petition that Didyme came in, insulted and physically struck him, and then railed furiously at some of his daughter’s sons (whom he now calls as witnesses). There are lots of interesting questions that this document raises. First, the sons mentioned here are living with their maternal grandfather (their mother’s father) and are to be relied upon to provide valuable witness. How common was it for grandparents to share an active role in children’s home lives and up-bringing? And where are the children’s parents in this household? Second, the implication here is that Didyme has accused the boys of having done something to warrant her anger — but what? Third, the children were living in a household environment in which non-kin household members, or even adjunct family units (in this case a cook and his wife) were workers and/or lodgers — how common was this? Children also feature in contexts outside of the family home. From the age of 10 years upwards boys (and sometimes girls) could be contracted as apprentices for a specified nubmer of years to learn trades such as weaving, and were often sent to live with their new apprentice master or at least work with them ‘from sunrise until sunset’. Numerous formal contracts are testament to some of the working and learning arrangements in place. Conditions for children learning a trade would have varied – particularly if there were other children engaged in work at the same workshop – and it is possble that, once they grew up, children maintained a strong relationship with their master. In a letter (P.Oxy. LV 3809, 2nd/3rd c. CE) a young barber writes proudly to his former master to give news of his success in finding a job – he boasts about his responsibilities and asks to pass on greetings to his fellow apprentices and former peers. The children of Oxyrhynchos experienced life growing up in a major metropolis from a range of perspectives, and their experience was often determined by their age, gender and social status. We have documents telling us about: the movement of children who were bought and sold as slaves; applications for boys’ (and sometimes girls’) registration into the metropoliltan urban elite group known as the gymnasium (the group to which 14 year old boys would have been officially registered, in a similar manner as the ephebate in Classical Athens); and private letters referring to children in affectionate terms. Others children were involved in aspects of religious, cultic, economic, or political life in the city. So why is it interesting to study children in the context of this ancient metropolis? 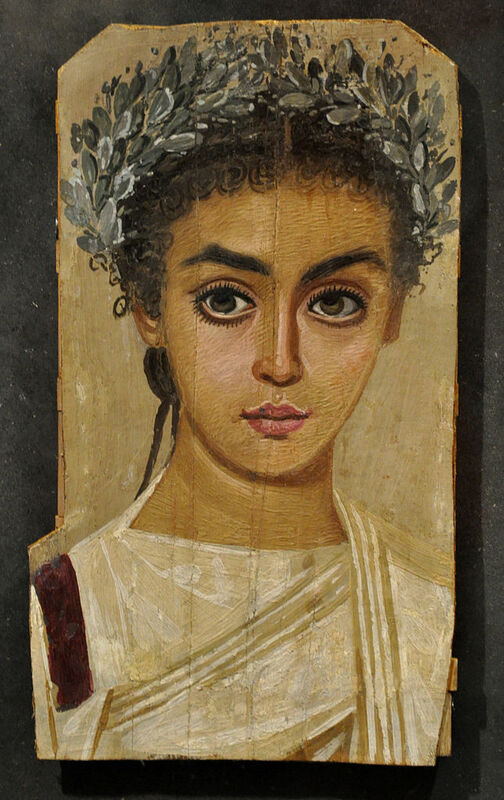 The demographic profile of the ancient world was such that we can expect the populations of Roman Egypt to have been very ‘young’, that is, the proportion of children to adults was relatively large by modern, western standards. This means there were plenty of children around within households, around the city and in the fields. Why do we know so little about their perspectives on life in the ancient world? Children are a group (if we can consider them a social or cultural group) whose voices are rearely heard from the sources, but the ways in which children viewed and negotiated their physical, social and cultural environment, and their place within it, tells us a lot about those cultures. All children, of course, grow up. Transitions from birth, through infancy, childhood and adolescence to adulthood are culturally construed and determined. If we can reconstruct children’s lives in an ancient metropolis like Oxyrhynchos then this can tell us a lot about everyday life in general in an ancient city. This enriches our understanding of how ancient societies and cultures operated and varied.